In the bible's old testament, I Kings 7:23 implies that = 3. About 480 AD in China, Tsu Ch'ung-Chi gave = 355/113 (3.1415929...) which is 7 digits of accuracy. Not until the 15th century did Al-Kashi reach 16 digits. Ludolph van Ceulen (1540-1610) reached 20, then 32, then 35 digits. They are carved on his gravestone in the church in Leyden. In 1706 John Machin calculated 100 digits. Finally, Johann Lambertz (1728-1777) proved that is irrational (i.e. is not expressible as a fraction). His personal best approximation was 1,019,514,486,099,146 / 324,521,540,032,945. 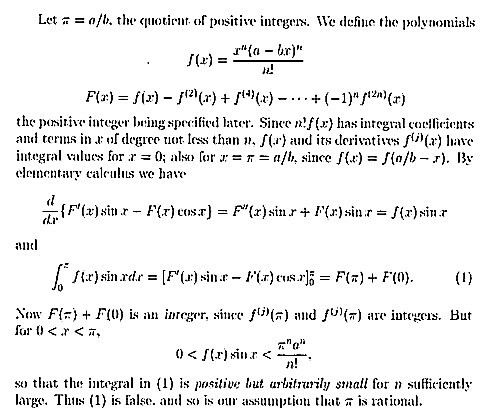 Here is a shorter proof that is irrational. In 1853 William Shanks calculated to 707 places, but made a mistake in the 528th position. All these calculations so far were done manually. The error was not found until 1945 when Ferguson used a desk calculator.